Home > Ask Our Experts > How to Manage Waste From Litter Tray in Rural Area? What would be the most environmentally friendly way of managing the waste from litter trays in a rural property with a septic tank, and what type of litter would be best to use? With landfill sites under increasing pressure, it is a very good idea for cat owners to look for an environmentally friendly option for their pet’s toilet. When you are looking for cat litter, you should stay clear of ‘clay-based’ litters as these can ONLY be disposed of at a landfill site and the bentonite clay ingredient is strip mined - so this is definitely not an environmentally friendly option! Wood pellets, which are essentially compressed sawdust, are very popular as cat litter. When your cat urinates on the pellets, they dissolve into sawdust which can then be picked up and disposed of in any outdoor area while the faeces can be flushed down the toilet. 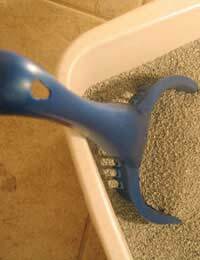 A major advantage of this type of cat litter is that it actually deodorises the litter and it is also a very cheap option. The only drawback is that cat poop can contain parasites which aren’t healthy for humans! Another ‘green’ idea for cat litter is to use corn kernels which are pretty much dust-free and clump together very easily. They also give off a natural fresh corn odour and one of the main selling points of cat litter is deodorant to mask the smell of cat urine. You could also consider biodegradable bags or litter liners. The main ingredients of these are petroleum and corn which give the bags strength but also mean they will break down in a landfill site. Another excellent idea – which would both save you money and reduce environmental impact - would be to toilet train your cat. This may sound impossible, but it can be done. If you have the time and energy to spend with your cat, you could eliminate all your cat litter problems and feel good about saving the planet at the same time. You would need to take the cat to an outdoor area on a regular basis and encourage her to use her “toilet” by placing cat litter or her litter box on the spot until she begins to go there on her own. Of course, this is an option only if you are home for much of the time or you have a cat-flap so she can let herself out of the house when nature calls! "Toilet train your cat" ?! This is supposed to be about a cattery. As in, 'start a cattery'. Looks like this article was cut and pasted from elsewhere online. Useless. This was a short and direct response to a question asked from one of our readers as you can see.The toilet training aspect was general advice to cat owners, that the author (a cattery owner) thought would be useful. "Toilet train your cat" ? !This is supposed to be about a cattery. As in, 'start a cattery'. Looks like this article was cut and pasted from elsewhere online. Useless.